I love my Boo Boo, but one of her less redeeming qualities is definitely her breath. So when I received Dog Gone Breath’s all-new natural fresh breath remedy for dogs, I was ecstatic. I come in a chewable tablet form and the company will introduce a powder in the new year. Bad breath in dogs has many causes, which are typically symptomatic of an underlying health issue. The two most common causes of halitosis, the medical term for bad breath, in dogs come either from the mouth or the gut While most products sold in the marketplace mask the symptoms by giving the dog a mint, Dog Gone Breath goes after the root causes and works on eliminating the source of the problem. 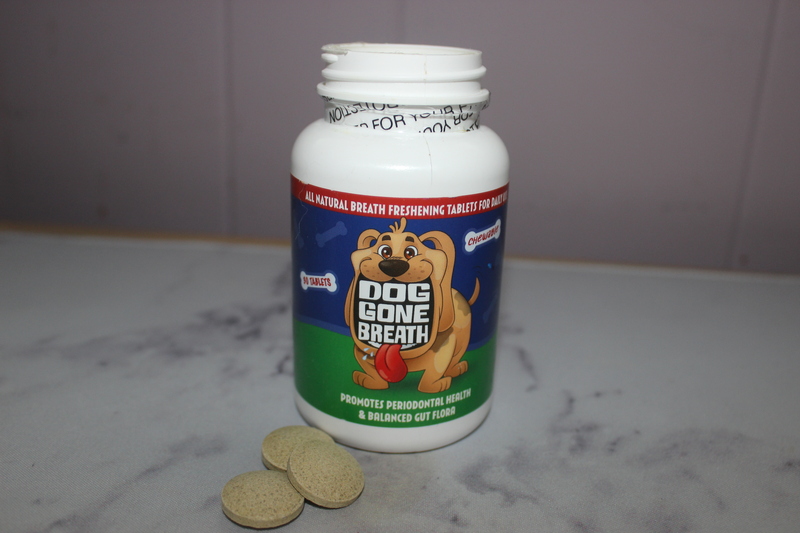 Dog Gone Breath promotes an overall healthier and happier dog. The ingredients in Dog Gone Breath are all natural and include Cardamom Seed Powder, Carrot Powder, Chicory Root (Inulin), Chlorella Powder, Cinnamon, Coconut Oil Powder, Ginger Root Extract, Kelp, Licorice Root Extract, Manuka Honey, N-Acetylcysteine, Papain Powder, Parsley Powder, Peppermint Leaf Powder, Slippery Elm Bark Powder, Tumeric Powder, and Yucca Schidigera. Available exclusively at www.doggonebreath.com with an MSRP of $19.99 for 60 tablets and 3.5 ounce powder, and $34.99 for 120 tablets. I gave Boo a tablet and a half for the first week and reduced it to one tablet a week later, per the instructions. I noticed a difference right away after giving it to her, making puppy kisses more desirable.